I am enclosing pictures of the Tornado 18 originally built by Dennis Goodenough in 1972 (your brochure boat). 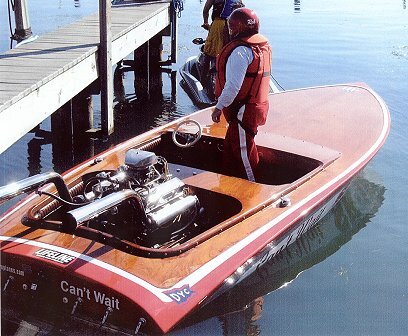 I am running it as a vintage SK runabout on the APBA eastern circuit. It runs great and is fast enough for an old guy like me. I've been doing this flat-bottom stuff since 1957. The picture running is at the Detroit Gold Cup in July 2005. The other picture is at the Buffalo Antique and Vintage sow in September 2005.